How Did California’s Prop 65 Law Go So Wrong? It was meant to inform and protect consumers. Instead it just makes shady lawyers rich off corporate blackmail. State-based Action Alert! In 1986, California voters passed the Safe Drinking Water and Toxic Enforcement Act of 1986, generally referred to as Proposition 65, or “Prop 65.” A new white paper by ANH-USA shows how the original intent of Prop 65 has been steadily subverted by special interests. The law stemmed from a growing concern that many chemicals may cause cancer, birth defects, or other reproductive harm. Under Prop 65, chemicals identified by the state as having even a one-in-100,000 chance of causing such harm may not be discharged into drinking water or onto land where they could contaminate sources of drinking water. In addition, manufacturers are required to post clear and reasonable warnings on any products, or in any locations, that could “knowingly and intentionally” expose consumers to any of these listed chemicals. The state is required to update the list of harmful chemicals annually. As of 2015, the list includes almost 900 items. Properly drafted, this act might have done some good. Part of the bedrock of ANH-USA’s philosophy is informed choice, which means providing consumers with the information necessary to make educated decisions about the products they buy. This is the basis of our support for labeling foods containing GMOs, our opposition to state or federal vaccine mandates, our opposition to health monopolies, and a variety of other issues (see our recent article on recycled fracking fluid being used on crops without informing consumers). California’s Prop 65, however, is a case study in unintended consequences. What was meant to be a public health initiative to inform consumers of potential hazards has been rendered meaningless by an industry of trial lawyers claiming to act in the public interest while they use the law to line their own pockets. Our white paper, prepared for California lawmakers, provides more detail, but here’s the quick version of how this works. Prop 65 sets up a system in which private parties, in addition to the attorney general and other entities, can bring a lawsuit against a company for failing to label their products in keeping with Prop 65’s guidelines. Rather than serving as a valid and useful enforcement mechanism, the private right of action has been exploited by “bounty hunters” seeking attorneys’ fees and settlements rather than improving public safety. Private parties are guaranteed 25% of any civil penalties resulting from the suit and are reimbursed for attorneys’ fees, creating a profit incentive for even meritless litigation. And the financial incentives for filing suit against companies don’t stop there. Prop 65 settlements often establish payments in lieu of penalties in which private organizations designated by the plaintiff receive money that would otherwise have gone to the state. Because there is no state oversight, we believe law firms then use these payments to bring more lawsuits, force similar settlements, and continue the cycle, since they know full well that companies cannot afford the astronomical cost of prolonged litigation. In other words, it looks like a racket to us. And there is a lot of money to be had. In 2013, Prop 65 settlements included over $12 million in attorneys’ fees alone. The law firms have gotten adept at milking this system to their benefit, working with the same few plaintiffs to bring dozens of Prop 65 cases. In fact, just two plaintiffs were involved in 83 of 187 settlements in 2010. Why is this important? An herbal supplement company could, for instance, face a lawsuit for not labeling a folate product that contains naturally occurring lead just above the allowable limit established by Prop 65. These are not toxic levels of lead, mind you, but levels similar to those one might expect from eating a serving of spinach. Our bodies expect and are designed to remove these naturally occurring levels of lead or other heavy metals. What does a warning label on these products accomplish? It isn’t keeping consumers safe—rather, it is discouraging them from taking supplements that help them. It also isn’t changing the practices of supplement companies, since the lead levels in the products are naturally occurring. The only way to avoid the lead is to create a synthetic supplement, and that is certainly not an improvement! As it stands now, supplement companies making quality products are forced to put the same label on their products as a stain-removing laundry detergent containing large amounts of formaldehyde. Does this really help consumers? As a result, many companies simply choose not to do business in California. Other companies that sell into California choose to label their products as a precautionary measure to avoid potential lawsuits, even when it is not warranted. This is all the more necessary because California does not, in many cases, even say what a toxic level is. The producer just has to guess at what might trigger a suit. This is crazy. 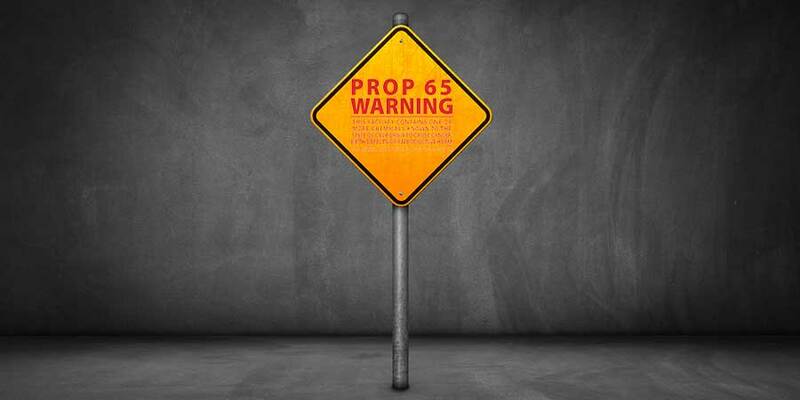 Prop 65 warning labels are now found everywhere—in restaurants, beaches, parking garages, and auto repair shops, as well as on marking pens, art supplies, faucets, gardening products, medical supplies, window treatments—and many more. The warnings are ubiquitous, rendering them meaningless to consumers. Action Alert! If you are a resident of California, please contact your state legislators and urge them to amend Prop 65 to provide meaningful protections to consumers, rather than hand over settlement money to opportunistic trial lawyers. Please send your message immediately.